I am grateful for Interac Debit. Interac Debit is a simple way to pay for purchases at store with out having to carry cash with you and the best part is that the money comes directly out of your bank account. I am grateful for Dry Cereal, Dry Cereal makes a gate light snack or something to just nibble on while working on at your desk. You can even mix multiple types of dry cereal together to make a little party mix of flavors. I am grateful for ice cube trays. Ice cube trays are not only used for making ice in your freezer, you can use them to freeze broth, fruit puree and many other things. Try freezing some cream or milk for when you need just a little for cooking. 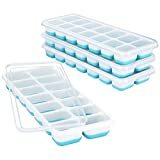 【More Than an Ice Cube Tray.】 This set of ice cube trays with removable lids enable you make ice cubes easily. 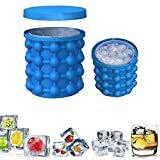 You can put the ice into cocktails, orange juice, whiskey or other beverages to enjoy a cool drink.Besides water, you can fill the mold with fruits, ice cream, soda, or wine. 【Professional Quality.】 Made of flexible plastic material and certified by LFGB, these silicon ice cube trays are of premium quality and high durability. We ensure that you get the food-safe, sanitary and quality-assured molds. 【Removable Spill-Resistant Lid Included.】 ice cube comes with a lid. This smart tool prevents spills and keeps ice cube tray from absorbing freezer odors. What is more, cube trays stack easily and neatly in the freezer without sticking. 【Easy Ice Removal.】 TPE (Thermoplastic Elastomer) material shapes the bottom, which makes ice mold cube exceedingly easy to remove ice cubes. Individual flat cube compartment is separate from each other so you can easily push cube from the bottom. No need for awkward bending & twisting. 【A Smart Gadget with Pleasant Color.】 Easy to fill, easy to use and easy to clean, these ice cube trays are dishwasher safe. White and green color looks comfortable and pleasant. 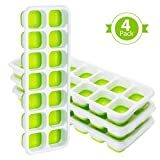 Ice cube tray includes 4 trays and each ice tray makes 14 nice-sized ice cubes for a total of 56.You can't miss such a lovely and pretty kitchen gadget. ❄ 【Safe Material】 Made of food safe silicone without BPA, safe and non-toxic, dishwasher safe. The pack contains 1 ice bucket and 1 lid. ❄ 【Double-Chamber Design】 Unique dual-chamber design - indoor and outdoor chambers, large capacity can hold up to 120 ice cubes, enough to share with family and friends. ❄ 【Save Space】 Size - 10*8cm/3.9*3.0in inches to save a lot of space for your freezer. The airtight lid covers keep the cube fresh and odorless. ❄ 【Many occasions】 Suitable for cooling all drinks in bars, parties, restaurants or clubs. It can provide long cooling for whiskey, cocktails, beer, other alcoholic and soft drinks. ❄ 【Note】 When you buy a real ice bucket in our shop, we guarantee 100% product quality. It is recommended that you recognize the real ice cube maker, if you buy fakes in other stores, we can not provide customer service. a lot of space in your freezer. Keeps your cubes fresh and odor free with air tight lid. EASY ICE REMOVAL. Each ice cube is separated and TPE （Silicone）material shapes the base well. It's easy to remove the cubes and left no residue. Just pat the bottom and then push it. REMOVABLE LID & BETTER SEALING. Keep ice cubes from absorbing freezer smells. The lid seals water into tray before freezing and prevents spills from any angle. It allows for stacking. You can storage it easily and neatly. DISHWASHER SAFE. Designed with good toughness, the tray is not easily cracked. DISHWASHER SAFE. Designed with good toughness, the tray is not easily cracked. After making ice cube with fruits, ice cream, soda or wine, you can put them into your dishwasher directly. FOOD-GRADE SAFETY MATERIAL. Certified by LFGB, PP and TPE（Silicone） material can direct contact with food. You can use it to make food for your baby with no worry. The material is also durable.